Tracklist: Nancy Whisky; Johnnie o' Brime; The Earl o' Cassillis Lady (The Gyspie Laddies); Lord Donald;. The Ale Wife; The Auld Beggar Man; Molly Baun; The Tinkler’s Waddin'; The Lassie Gaitherin’ Nuts; The Beggar’s Daughty; The Cruel Mother; The Band o’ Shearers; She's Only My Auld Sheen; The Rigs o’ Rye; The Laird o’ Drum; Waulkin’ Song. More than thirty years away from his native land, it is hardly surprising the Norman Kennedy’s name is no longer as well known in Scotland as it once was, or indeed as well known as it deserves to be. Norman was a well respected singer in the early 1960s when he was living in Aberdeen. He befriended Jeannie Robertson and he clearly learned a good deal from the great singer. Echoes of Jeannie can still be heard in much of Norman’s singing. There were many aspects of traditional culture that Norman taught himself, singing and storytelling were only part of this. He travelled to the Hebrides to absorb as much as he could of Gaelic language and culture. He also learned to card, spin and weave wool, even waulking the tweed in the traditional manner. This leads us to that perpetual question about where Norman stands vis-à-vis the tradition. Here’s what Tom Spiers says on the matter, "He wasn't born on a farm, or in a travellers’ tent, but he learned his songs orally from those who had been. He was one of the few 'toonsers' to be afforded the reverence normally reserved for Traditional Singers and fits more perfectly than anyone else I can think of, the accolade of Tradition Bearer." Mike Seeger heard him in Aberdeen in 1964 and invited him to sing at the Newport Folk Festival. Norman loved the States and was quick to make his home there and Tom tells us how his quickly found his niche there, "For the last 35 years, all his energy has gone into spinning, weaving, singing and storytelling for a huge audience of appreciative 2nd, 3rd and 4th generation Scots who wanted to keep in touch with their roots." These comments may answer my puzzlement about how someone could have maintained such broad, almost archaic, Aberdonian speech patterns as we hear in his introductions; if Norman is part of the Scots-American heritage industry, then such a brogue would be a big advantage. His voice was heard on two Topic compilation albums at the time. (12T133 - New Voices from Scotland and 12T169 - A Prospect of Scotland) before recording his own solo album Scots Songs and Ballads (12T178). The high opinion that these recordings are still held in is reflected in the fact that some of them have been repackaged as part of the recent Topic CD English & Scottish Folk Ballads (TSCD 480). We can hear from the songs on this album that Norman is still a considerable singer and that a new album of his singing is an excellent album. The question must be whether this is the album that was required. 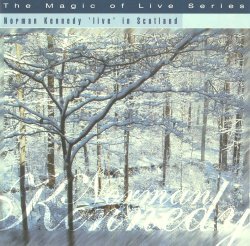 Norman returned for a short visit to Scotland in 1996 and Tom Spiers recorded three concerts that he gave in Aberdeen. The problems the surround recording live concerts are legion; because there are so many variables, one must be very lucky to come out of it with anything that would be worthy of commercial release. That Tom had such excellent recording equipment only compounds the problems that these recordings throw up. From track to track, we get Norman’s voice coming from a different apparent angle from the stereo speakers according to where he was standing in relation to the mics in each concert. This is disconcerting as is the fact that the recording level also varies from track to track. Understandably, Norman’s concern is putting his songs over to his audience rather than the recording and we hear him increasing the tempo of a number of his ballads as he feels the audience getting involved with the story. On a number of rhythmic pieces, Norman is tapping his foot quite loudly as he sings; this helps with the waulking song, but hinders elsewhere. On a beautiful rendition of Lord Donald, we can hear what sound like kitchen noises going on. Then there are the members of the audience providing coughs, joining in and then dropping out of the singing of verses. Tom leaves in a false start, as Norman means to sing The Beggar’s Daughty in June and sets out with The Rigs of Rye in July. His recovery is skilful and humorous, but it is not the sort of thing that bears repeated playing, though the subsequent singing is, like most of the performances, a delight. Even then, it sounds like the microphone has been knocked towards the end of it. If this were a posthumous compilation to mark a singer that never got into a studio then this sort of album would have been OK. As it is, it seems to be a missed opportunity. We know that Tom has skills as a recording engineer, as his recording of his own singing for release in this series shows. It is a pity that he could not have got together with this very fine singer outside of public performance to show his talent to the best effect.